Are you an athlete or parent of an athlete who needs to unlock your potential to perform at the next level. 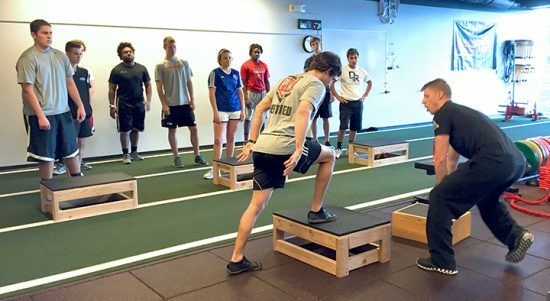 Our High School/ College Prep class is a group for Freshman-Seniors who are ready to learn what it takes to train their body for peak performance. These classes are 90 minutes and focus on plyometrics, movement mechanics, fundamental to professional strength/power training, energy systems development(“cardio”), and injury prevention. Athletes will work their way through three different phases before eventually being given their own personalized card. Is your child growing up fast? Are you noticing some “goofy feet/movement” and want them to learn proper movement patterns and injury prevention techniques as they grow into their body? Our Youth Performance Development Class is a perfect fit for Middle School-aged athletes. During our 60-minute class we will prepare them for the next step by developing a foundation that will set them up for success for years to come. Fundamental strength and movement training at an age when children and athletes are developing movement competencies at an enhanced rate is often overlooked. We will prepare them for the weight room as well as the next level on the field/court of play by teaching them about proper movement preparation techniques, proper force production and landing mechanics (plyometrics), fundamental movement mechanics for linear and multidirectional agility, as well as injury prevention, foundational strength training and the importance of corrective exercise, and energy systems development, all in a fun and engaging environment.